I’m pretty evangelical about LED light bulbs. Did you know that because of the longevity and efficiency of LEDs, it pays to replace working light bulbs of any other form if these are used more than a few hours a day? Are you aware that higher power LED bulbs that are now available for larger rooms? 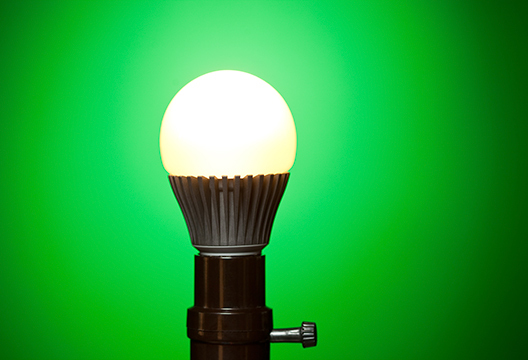 LED bulbs are now widely available, and don’t cost as much as you might think. Now that we’ve had this little chat, perhaps you will buy LED bulbs or talk to others about them. More and more LED lighting is being purchased, partly because of restrictions on old technology, but often because of interpersonal influence. In fact, pick any topic, from housing to smartphones, and your views and your likelihood of purchase are affected by advice and gossip. Despite this, we do not have a satisfactory description of the social exchanges that are involved. This is, or should be, a major concern among social scientists who want their subject to have influence. Political scientists need to understand how new parties grow or die and their policies take root or wither. Sociologists are interested in the acceptance of new norms and forms of association. Marketers want to predict the demand over time for new products. Some mathematical modellers have offered macro-models of the adoption of innovations while others have proposed agent-based models designed to show the aggregate effect of specific rules of interaction at the individual level. Collectively, we need to make many changes to protect our environment; a fuller understanding of the diffusion process will help us to steer those changes. Despite the wide relevance of this field, academic progress has been slow. One reason for this has been the segregation of social scientists into academic silos so that there is limited transfer of new thinking from one discipline to another. A second reason has been the difficulty of applying rigorous techniques to such a socially embedded field – information must often be gathered by survey. A further consideration is that the subject, by tradition, has been ‘owned’ by sociologists who have not looked sufficiently at the interpersonal processes involved in the diffusion of ideas and practices. I believe that these interpersonal processes are key to greater understanding. Social psychologists can therefore help this field to advance by describing the mechanisms whereby one person influences another, and by conducting tests on such mechanisms. The social science of diffusion began in 19th century France with the work of Gabriel Tarde, a lawyer-turned-sociologist who was fascinated by the growth of fashions and practices. He had followed Thomas Robert Malthus’ earlier work on population and resource growth and applied this thinking to innovation. Adoptions typically follow an S-shaped growth curve: slow at first but accelerating, then decelerating and levelling off. This adoption pattern was studied by Rogers (2003), Lazarsfeld and colleagues (1944) and Katz (1957), who identified a two-step mechanism whereby a limited number of early-adopting opinion leaders engineered the later adoption by many others. This idea of opinion leaders (‘influencers’ or ‘hubs’) as the main agents of change has been very popular among sociologists as well as marketing practitioners. Bass (1969) represented diffusion mathematically and his model showed the S-shaped pattern of adoption. Bass assumes that innovations are introduced to social networks by advertising, political pressure or some other external force; and then social influence processes, internal to the network, increasingly take over as the number of adopters increases. The growth in the number of adopters reaches a point of inflection when those who have adopted start to exceed those yet to adopt – hence the S-shape. Parameters specify the strength of the external and internal forces. Yet the total number who will adopt, and the external and internal parameters, are not known in advance and must be estimated from evidence on related products. There is agreement across these different academic approaches that person-to-person influence is a major factor in the diffusion of new ideas and practices. Adopters induce others to adopt, who then induce more people to adopt and so on. This linear progression is often described as the epidemiological model because it follows the pattern of a disease where illness confers immunity to reinfection: there is no feedback in this model. My view is that the epidemiological model is insufficient and that there are other processes involved, one of which does involve feedback. Our work on word of mouth about products suggests that most recommendations are given by current and past users. Survey results (East, Singh et al., 2017) showed that only seven per cent of brand recommendations were given by those who had never owned the brand. In addition, it is positive advice rather than negative advice that predominates; we found that positive word of mouth was about three times as common as negative across a range of products. We also found no support for the widespread belief that negative word of mouth has more impact than positive. What has been missing from previous accounts of user behaviour is that in addition to inducing adoptions among non-users, a person making recommendations may also stimulate renewed word of mouth among current and past users. Many readers may recognise that they have passed on new information about favoured products or ideas in this way; this is arguably easier to do than ever, with retweets on Twitter and ‘likes’ on Facebook etc. This influence of users on other users is a feedback process, a form of social amplification (East, Uncles et al., 2017). But how much does this social amplification contribute to the diffusion of innovation? It’s actually quite difficult to demonstrate the scale of social amplification in everyday settings. Our procedure was to conduct surveys on users of specific products (films, mobile phones, vacation destinations, restaurants, fashion stores and hotels). We asked: ‘in the last four weeks, how many times have you made positive comments about your X? (If you bought within the last four weeks, in the period since you bought)’. We also asked whether they had heard other people recommend their X. Compared with those who had not heard their product recommended, those who had gave nearly twice as many recommendations. The two-to-one ratio could have been produced by factors such as product satisfaction or a general tendency to give and receive more word of mouth (called mavenism), so we included measures for these factors in the regression analysis. Receiving word of mouth on a brand remained a strong predictor of giving word of mouth on that brand. Other features of the study suggested that one reason why receiving word of mouth had this effect was that it provided a script that could easily be used later to give recommendations. Of course, ingenious explanations might reverse the implied causal sequence, and other uncontrolled factors could be involved. A more rigorous test is needed if social amplification is to become accepted as a mechanism involved in diffusion. I describe these briefly in the hope that they will encourage further research. One approach is via recording everyday conversations. Word of mouth on any topic is infrequent so that observations need to be gathered over a fairly long period. This means that participants would have to carry recorders for a few weeks, which would not be easy and, coupled with this, there are problems of obtaining consent from others when this method is used. When experiments are used, several designs are required to ensure that the different circumstances of giving and receiving word of mouth are covered. One problem is the variety of forms of word of mouth. Christiansen and Tax (2000) suggest a procedure where one or both members of a dyad are instructed to give advice on a product to the other. They could be instructed to talk about a brand already owned by the receiver in one condition and a never-owned brand in another. The participants can choose the product category and the content of their advice and thus quite varied recommendations may be produced. The receiver of advice would be asked to complete a survey asking about their ownership of the product mentioned and the number of recommendations they had made of this product in the previous week. After an interval of a week, receivers would be re-interviewed, and asked about recommendations and purchases made after the dyadic interaction took place. In this way, the influence of advice on existing users could be measured. Another more economical approach would be to use classes of students. Three apps for mobile phones could be presented by the demonstrator, choosing ones that were much used, little used and used by about half the students. As in the previous design, there would be questions about ownership and recommendation in the previous week and a follow-up survey a week later. If such designs reveal a substantial effect from social amplification, modelling designs will need to be recast. There may also be new insights into how people are influenced. For instance, it is generally thought that brand advertising is received more by those who have already adopted the brand, which suggests that advertising content should emphasise material that could easily be repeated in word of mouth. Relevant to this, we have found that nearly half of all word of mouth about durables was stimulated by advertising and, surprisingly, this transmission of content is not evaluated in most assessments of advertising effectiveness. Along the same lines, politicians should think less about convincing doubters and more about supplying their followers with information that could be used in conversations. In the social sphere, information intended for elderly people might, in part, be directed to their children, who may be able to use it more persuasively. After a lifetime of research, I remain fascinated by the process of discovery. As Gary Klein (2013) has indicated, people need quite strong environmental or informational challenges to get them to produce insights. Often these insights languish because an incumbent theory seems to do the job. In this case, the epidemiological model is familiar and embodies asymmetric and transitive relationships that people find congenial – in gestalt terms, such relationships have ‘good form’. Challenger theories have an uphill task in these circumstances. That is why I wrote this article; I do not want a good idea to go to waste. Bass, F.M. (1969). A new product growth model for consumer durables. Management Science 15(5): 215-227. Christiansen, T. and Tax, S. S. (2000). Measuring word of mouth: the questions of who and when? Journal of Marketing Communications, 6, 185–199. East, R., Singh, J., Wright, M. and Vanhuele, M. (2017) Consumer Behaviour: Applications in Marketing, ch. 12, London, Sage. East, R. Uncles, M., Romaniuk, J. and Lomax, W. (2017). Social amplification: A mechanism for the spread of brand usage. Australasian Marketing Journal 25(1), 20-25. Katz, E. (1957). The two-step flow of communications: An up-to-date report on an hypothesis. Political Opinion Quarterly, 21(1): 61-78. Klein, G. (2013). Seeing what Others Don’t: The Remarkable Ways We Gain Insights. New York: Public Affairs. Lazarsfeld, P.F., Berelson, B. and Gaudet, H. (1944). The People’s Choice: How the Voter Makes up his Mind in a Presidential Campaign. New York: Columbia University Press. Rogers, E.R. (2003). Diffusion of Innovations, 5th Ed., New York: Free Press.